What you should consider when comparing the different bassinets ? Bassinets are cute and pleasant place to welcome your little one. They can replace a crib for some period, between 4-5 months of baby’s life. But, how to choose the right bassinet for your baby? Today there are so many bassinets on the market from different manufacturers and in different designs, functions and features. We are also parents and we know how difficult and tiresome can be to choose the right one. That is why we made this research and choose the top 10 best baby bassinets analyzing all their benefits and disadvantages in order to make your life easier. 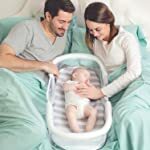 Before we come to product reviews, we made the product summary where you can get the first impression about the products and differences between them based on important features that should be considered when deciding for the best baby bassinet to buy. Graco’s Pack ‘n Play Playard is not just a bassinet but also a place where you can put your diapers, wipes and other important things for you and your baby thanks to built-in storage pockets. This is removable bassinet that contains folding feet and wheels. For the case you are looking for a bassinet with a feature that will keep your baby busy and satisfied then this bassinet could be the solution containing The Go travel playard with a toy bar with 3 soft toys. 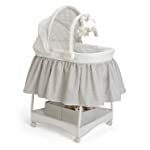 Delta Children’s Sweet Beginnings Bassinet is adjustable and contains removable canopy. In comparison to Gracko Pack N Play that has The Go travel playard to entertain your baby, this bassinet contains calming electronic music module with nightlight and gentle vibration that will help you to lull your little one. The bassinet is designed for infants up to 15 pounds. One more, important thing is that you have manufacturer guarantee for this product and the free replacement parts. What makes SwaddleMe By Your Side Sleeper different from the other bassinets on this list are the mesh sides that circulate air and in the same time allow you to see what happens with a baby. That is why it can be a good choice if you are looking for a solution to keep your baby on eye. It also has a sturdy metal frame fold if you are planning to travel with a baby. This bassinet is made for use till baby starts to push up or roll over. Looking for a bassinet with plenty of sounds and vibrations to lull your baby? 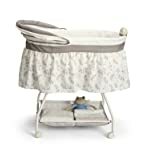 Summer Infant Classic Comfort Wood Bassinet, Fox and Friends, Espresso Stain offers 4 musical melodies, 2 nature sounds, 1 womb sound and soothing vibrations. 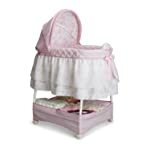 This is baby friendly bassinet with an adjustable canopy and large storage basket. Thanks to implemented wheels you will easily move the bassinet anywhere you want. It is made from 100% wood and its timeless design and espresso stained hardwood can complement any decor. 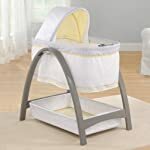 Delta Children Smooth Glide Bassinet, Silver Linings is one more, good bassinet if your priority is to lull and entertain your baby. 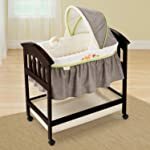 In comparison to above described Summer Infant Classic Comfort Wood Bassinet, besides sound effects this bassinet contains soft nightlight The bassinet is made for infants up to 15 pounds. 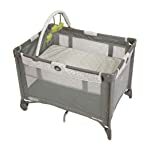 What also makes this bassinet different in comparison to others on this list is a large, two sections storage basket for all baby’s stuff. If the safety is on the first place for you when choosing the bassinet for your baby, then HALO Premiere Series Swivel 360 degree Sleeper Bassinest might be what you need. Its unique feature allows you to rotate it 360 degrees for the ultimate convenience and safety. You will be able to be close to your baby as much as you want while have it sleeping in its own separate area so the risk of bad sharing will be reduced. This bassinet also has 2 levels of vibration, nursing timer, soothing nightlight, sounds and music. Summer Infant Soothe & Sleep Bassinet with Motion is combination of safety and features that will help you to lull your baby. This bassinet is very similar to Summer Infant Classic Comfort Wood Bassinet, Fox and Friends, Espresso Stain, it also has 4 peaceful melodies, 3 calming sounds and soothing vibrations. There is also adjustable canopy that provides a darkened sleeping environment and easy-roll wheels that allow you to move the bassinet wherever you want. HALO Bassinest Swivel Sleeper Bassinet – Essentia Series, Honeycomb comes from the same family of bassinets as the HALO Premiere Series Swivel 360 degree Sleeper Bassinest with similar features. You can rotate it and swivel 360 degrees to bring your baby closer to your bad avoiding in the same time bed sharing for better security. The difference between these two models is that Essentia Series is the newer one, with improved feature – polyurethane waterproof mattress pad. There is also difference in higher price in comparison to other bassinets on our list. If you are looking for rocking girly bassinet the maybe you should consider this one. 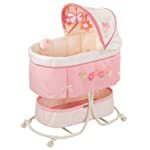 Delta Children Gliding Bassinet, Disney Princess has an attractive design with soft, pink colors for your princess. It has adjustable, removable canopy and large storage basket where you can put all baby’s essentials. There is also gliding base and locking casters that allow you to move the bassinet from room to room. This bassinet is eligible for free replacement parts. For those parents who like modern looking bassinet with advanced lulling features Summer Infant Bentwood Bassinet with Motion, Chevron Leaf can be an interesting choice. It has a multispeed silent sway motion made to naturally soothe baby to sleep. Besides that, it has 4 peaceful melodies and 3 calming sounds. There is also adjustable canopy with beautiful embroidery detail and an extra-large storage basket where you can put all baby’s staff. As we know that the best indicator of quality and performance is experience with the product, we tested all ten baby bassinets from our top list for the best baby bassinet to buy. The main trump of this baby bassinet that made us put it on this list was The Go travel playard. It was very to us to easy to set up this bassinet and take it apart later. At the first glance you will think that wheels on one side have no purpose, but then we figured out that they do have very practical role. When we tried to move it in different ways, all we had to do was to simply lift one sie and roll the bassinet out. The first thing we noted is the price of this bassinet. It is pretty affordable and is one of the leading sellers at Amazon and has acceptable features. The bassinet is easy to install and light to carry. The main feature of this bassinet is safety. In comparison to other co sleepers we tested, this one has the strongest sidewall protection. It has a sturdy mash, but soft to the touch. This will make really hard to your baby to break out of it. The conclusion we made after trying this bassinet is that it is cheap and easy keep it functional thanks to 3AA batteries. There are 7 different colors allowing you to match the bassinet to any environment. This bassinet is easy to put together. It is neutral and classic, so it can match with any environment. Night light is pretty handy to check the baby at night and the three plush bears look very cute and they are a good way to entertain a baby. We were satisfied with the way it can be moved through the house. The bassinet is little shaky so it isn’t so safe for the baby and you have a feel like it will fall apart when you put a baby to it. The mattress is very thin and we weren’t satisfied with the quality. Changing the fitted sheet was very simple. One more advantage of this bassinet is that it swivels on arm and spins at the end of the arm so you can place it however you want and you don’t have to move the whole base. We had difficulties with moving it from room to room because of the heavy base. Good thing about this bassinet is that it can have many purposes. You can use it instead of bed for your baby, as a diaper changing table and play box. It has a big storage underneath the baby sits. There is also enough space for a big baby. It is one more convenient bassinet to have your baby close to bed and avoid the bed sharing. The bassinet can be easily swiveled 360 degrees so you can lay down the bed and sway it in a way you want. We were surprised because it is larger than we imagined. The pink color scheme is elegant and isn’t too bright and the canopy works well. There is a big storage area ideal for keeping diapers. There are vents on each side of the bassist to help keep the baby comfortable. We noted that the music is very low, so we could barely hear it. Setting this bassinet up was very easy. Our test showed this bassinet is very stable. There is also a useful storage shelf beneath the bassinet and nice sounds and music to lull a baby. 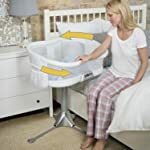 You can find the bassinets on the market that can be transformed into a cradle thanks to quick-release latch and retracting the wheels, that will make the unit to rock gently. There are also models glide that require batteries. Storage is one more important thing you should consider when buying a bassinet. It is necessary to have near you and to be big enough to put all the baby essentials you need. There are baby bassinets with casters that allow you to roll the entire bassinet around. One the other hand, you can find some having a handle so you can carry them. You can always buy a mattress or pad you like, but it would be good if you could use the one that comes with the bassinet. They shouldn’t be too thin and you should check their quality. It is one more plus if the bassinet includes soothing music or nature sounds with volume control. You can find the models with a soft night-light that allow you to peek in on your baby without disturbing it. A good bassinet must have a sturdy bottom and a wide, stable base. Always check if the bassinet has the JPMA seal. If you notice that legs or frame of the bassinet collapse for storage, always check that they lock into place when the unit is set up. Check that the mattress or pad is smooth and firm enough, and fit snugly. Don’t forget that any bassinet you buy is short term and that won’t be useful as soon as your baby starts to roll over. It is good that the sides of bassinet aren’t meshy in order to avoid potential risk that baby could suffocate against the side. Don’t forget to keep the receipt and the packaging as well as materials that came with the bassinet because you will need them if you decide to bring the bassinet back. Our favorite from the the top 10 best baby bassinets will definitely be the Summer Infant Soothe & Sleep Bassinet with Motion, Lila because it fulfills all the main features that should be considered when choosing the baby bassinet. It is safe for your baby and easy to move. It has an adjustable canopy and the set of music, sounds and soothing vibrations. It can be used for multiple purposes like bed for your baby, a diaper changing table or a play box. The disadvantages like difficulties with screws, no batteries included and thin padding is something that can be easily fixed and is negligible in comparison to benefits and the price of this product.